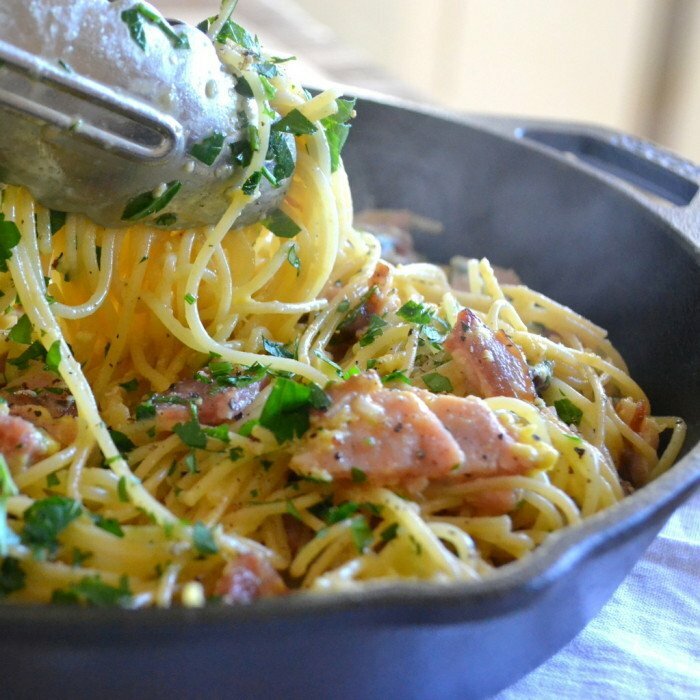 Breakfast Pasta ~ it's modeled after pasta carbonara, but with a heavier emphasis on the meat and eggs. I used the ever present leftover ham, and a few slices of apple wood smoked bacon for this magical skillet pasta! Cook the pasta in salted water until just al dente. Meanwhile, cook the bacon in a large skillet until it's crisp. Add the ham and garlic and saute for a few minutes. Add a little olive oil if the bacon didn't render much fat. In a small bowl, mix the cheese into the beaten eggs, and grind some black pepper in as well. When the pasta is ready, drain and reserve 1 cup of the cooking liquid. Add the pasta to the skillet and toss, along with the egg and cheese mixture, and parsley. Continue tossing over medium heat, adding a little of the reserved pasta water, until the eggs are cooked and the sauce is silky and thick. Add salt (if necessary) and more pepper to taste. Serve with extra parsley and cheese as garnish.